We're finally at a point in this series where the author doesn't feel the need to fill us in on everything that has happened before. All of the exposition is taken care of in a neat, quick prologue. 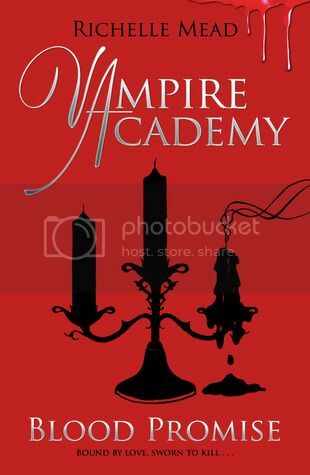 If you haven't read Vampire Academy, Frostbite and Shadow Kiss, go back and take a look at those first. The action in this book moves away from the school setting, when Rose abandons her best friend Lissa in order to track down her former lover Dimitri, who has been turned into a Strigoi. Rose and Dimitri promised each other that if they ever were to fall in battle, and turned into evil Strigoi, that they wouldn't stop until they'd put the other to rest, and Rose intends to make good on her promise. Having no idea where to begin her search, she decides to track down his family in Russia, hoping that maybe he would have returned there. Sure enough, she does find them, a strong family of women who eagerly accept her into their ranks. Spending time with Dimitri's sisters forces her to re-evaluate her harsh opinion of life outside of her professional duties. In them, she is able to witness warm family relationships for the first time. She also finds that Lissa's spirit ability isn't as rare as she thought, and meets a few more spirit users, including another bonded pair, who have discovered a completely different range of abilities. Rose also runs into Sydney, a human "Alchemist" part of a secret order who helps hide vampires from the rest of human society by destroying Strigoi bodies. The sudden inclusion of a whole new class of slayers stretched my suspension of disbelief. Rose is told that Alchemists are something that all dhampirs are told about once they graduate school and since she's a drop-out, that's why she hadn't heard of them. I thought it would have been a lot more believable if Alchemists were incredibly rare, or perhaps limited only to certain parts of Russia. After Rose joins forces with a group of dhampir vigilantes, she finally does track down Dimitri and is disturbed by how much like his old self he still seems. She hesitates a fraction too long, and ends up susceptible to his bite which leaves her completely addled. She then spends several weeks as his prisoner, as he tries to convince her to join by his side as a fully "awakened" Strigoi. For Rose, this is a real look at what life as a blood whore might look like. Seductive, enjoyable... but ultimately, quite empty. Luckily, she is able to come to her senses in time, and aided by some of the ghosts that she is occasionally able to call upon she finds the strength to try and stake Dimitri. Shortly after, she discovers that there may be a way to use Lissa's spirit ability to reverse the change to Strigoi, but unfortunately it will be too late for Dimitri... or is it? I will be interested to see how Rose will use her new hard-won knowledge of Strigoi physiology in the upcoming books of the series. I'm also hopeful (though, I wouldn't hold my breath) that Lissa will finally start to show some battle prowess herself, wielding magic to destroy her enemies in future installments of this series.